I have a friend who has a friend who used to live in a house with three French dudes- total New Girl scenario. She has this guy that she sometimes gets freaky with, and this weekend, they’d had a total Sexcapade. The man in question is a German stud, pictured above. The two had spent the previous night drinking heavily, followed by head-twirling passions only the truly amorous can understand. So when he woke up in the morning to go to the bathroom, I think it’s safe to say that maybe he hadn’t fully woken up, because as he was walking back to the Girl’s room, he took a wrong turn in this house of many winding and confusing corridors (not). He entered a bedroom and crawled into bed, completely naked, and snuggled up to his lover. With a soft whisper, his lips brushed against a neck not fully so smooth as he remembered…. “Good morning baby”. You see, the German stud had accidentally crawled into one of the French men’s beds, and was now cuddling him like it was his job. Now, if you are a guy, and you ever really, really want to piss of a French dude- this is a great way to do it! The Frenchie got so earth-shatteringly mad- a roar of anger and despair rose through the doomed house, a roar that could rival those of a thousand lost souls, screaming for mercy at the top of their wretched lungs. All hell broke lose, as the entire house woke up to the news that there was a German there, trying to molest the wrong person. Now, now, how bad can it be, being awoken in such a sweet and innocent way? Very, apparently. The German was banned from the house, and the Frenchie wouldn’t talk to the Girl for a whole week- talk about sore point, eh? 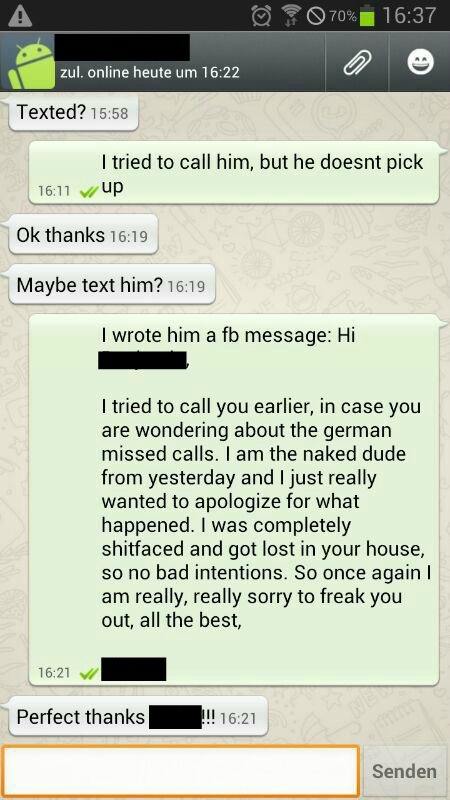 The German, feeling the need to make amends, sent the message you see below… If his quest to seek forgiveness worked or not, remains unclear. So let this be a lesson to all men- never cuddle a heterosexual, French male, unless specifically asked to. (im)moral of the story: If your geographical sense is less than perfect, leave a trail of string or something to guide you back to the right bedroom.